Guinness Pro14: Where we stand in Conference A? Exciting final block of games beckon! 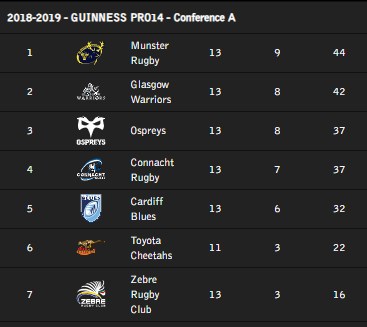 With European Cup action taking center stage for the next two weekends, it is time to review where we are in the Guinness Pro14 conferences and what we should expect when the league resumes at the end of this month. Hawkeye Sidekick takes on the story from here starting with Conference A.
Munster Rugby are top of the conference after last weekend’s set of results. The side produced their best attacking performance of the season in their BP win over Connacht Rugby on the road in round thirteen. Key European Cup fixtures beckon and the side will need to continue to evolve and improve on both sides of the ball to be a realistic Guinness Pro14 contender. The road trip fixture to Ospreys looks key in determining whether the side will be vying for a top spot playoff berth. Glasgow Warriors have hit a complete slump. Three consecutive league losses has opened the conference wide open. Warriors are a quality outfit but the European Cup pool finale could potentially shape how they perform upon the resumption of the league. I still think that they are the team to beat in this conference but the pack issues exposed in recent weeks and lack of cohesion in attacking play which surface against Edinburgh Rugby needs to be addressed in a hurry. Ospreys are currently in third position in the league; their form has been mixed in recent weeks. Good wins over Cardiff Blues and Scarlets but then a road trip loss to the Dragons. George North continues to impress with ball in hand. The big question for me on the Ospreys is when their key marquee players are away on international duty, how will the side perform? November saw some wretched performances on the road when their squad was stretched. This cannot be repeated coming down the homestretch. Connacht Rugby have shown massive upside this season. A new coach and revitalized mindset has seen the side play highly entertaining rugby this season. Their performance against Munster Rugby last weekend at times was sublime; quick ruck pass unleashing Tom Farrell and Cian Kelleher to create havoc in the Munster Rugby defensive ranks. When you consider that Aki, Buckley and O’Brien were out of the side against pretty much first team Munster Rugby outfit, it is where Connacht Rugby’s head space is at when they are disappointed by not winning the contest. A key home fixture against Ospreys could make or break the side’s season in a couple of weeks. Cardiff Blues have been frustrating to watch this season. When they click into gear, the side are loaded with threats from multiple areas. When they are not, they are mediocre. The key will be to figure out the consistency issues in the side. Blues have a couple of keynote fixtures against Conference A opposition upon league resumption; their road form has to improve for the side to be a serious playoff contender. Cheetahs. After a very slow start to the season, the side are starting to gain momentum. They were very impressive in their first run out of the year on the road to Zebre Rugby last weekend. Their expansive style of play will cause teams no end of issues. Two games in hand over everyone else in the conference, Cheetahs should account for the Southern Kings in the next few weeks. A potential ten points haul and they are back into playoff picture contention. For the league, Toyota Cheetahs need to be in the playoff mix. Zebre Rugby are cast adrift at the bottom of the conference. After early promise, squad depth issues have been ruthlessly exposed so the objective for Michael Bradley’s charges will be to aim for European Challenge Cup playoff contention. A hectic festive period sees teams juggle squad rotation to the max ahead of crunch European Cup fixtures next weekend. Munster Rugby travel to the Sportsground with a strong looking squad on paper against a Connacht Rugby side missing a couple of first team regulars. Leinster Rugby will be keen to get on winning ways as they entertain an Ulster Rugby side who have left off the majority of the marquee starters. Hawkeye Sidekick previews the action. The team selections for this RDS fixture left me quite underwhelmed. Ulster Rugby have decided to rest their first team stars with a key fixture against Racing 92 looming on the horizon next weekend. Leinster Rugby have juggled the team selection after an ill-disciplined performance against Munster Rugby on the road. The fixture looks like a cohesive mess. Ulster Rugby have looked at the fixture; weighed their options and decided that this fixture is beyond them. A bit harsh but when you decide to blood four academy players in the cauldron of the RDS after Leinster Rugby have just been beaten last time out, enough said. Lambs to the slaughter? The youngsters in the side will try hard but there is a feeling here of their Thomond Park performance on this one. It will be important for the likes of Herbst, O’Connor, Timoney, Shanahan and McPhilips to try and set the tone early for others to follow. The performance against Connacht Rugby last weekend was well off the standard required; pack struggled for set piece dominance and the back three defensively at times were caught more than once by Farrell, Aki and Godwin in ball carrying. Leinster Rugby’s video analysis of their Thomond Park first half performance would have been a sight to behold. Discipline went out the window in that opening period and cost them the game. Lowe’s red card capped off a horrendous half and it could have been worse. The only crumb of comfort for Cullen and Lancaster was the second half performance. With fourteen players, they defended with gusto and organization scoring two tries of their own. An intercept try from Earls deep in Munster Rugby territory was the only blotch to the copybook. The team selection from Leinster Rugby blends fringe players with players who need game time ahead of the crunch Toulouse fixture next weekend. Rob Kearney returns to the full back slot and his experience will be vital in organizing a talented but still raw back three. Adam Byrne and Barry Daly need game time and this will be a good hit out. I am particularly interested in how Ciaran Frawley bounces back from last weekend. His sub cameo unfortunately saw an errand pass which Earls intercepted and scored for the game winning try. Frawley’s response this weekend will be interesting, see if the player can dust himself down and perform to the high levels that he has produced so far this season. The pack looks abrasive despite key personnel absentees. Jack McGrath, Sean Cronin and Andrew Porter look a potent front row. Molony and Kearney are solid set piece operators and then there is massive youth, pace and power in Murphy, Penny and Deegan in the back row. The hope here is that Ulster Rugby start well with gusto and get an early lead. Anything else and this will be a long, arduous, horrendous experience for a talented yet inexperienced Ulster Rugby outfit. Leinster Rugby’s bench looks stacked as well if required. No rest for Ulster Rugby in this fixture I fear. The team selection from van Graan and Munster Rugby team selection speaks volumes; they have identified that the attacking side of the ball in the back line needs to tighten up and more game time this weekend ahead of a crucial European Cup fixture schedule is what is required. The big news is the return of Chris Farrell in the three quarters. If you are to believe some fan forums, Farrell’s absence has been the key reason for a stagnant back line performance. I think there is more than one player for the struggles but the Tyrone native’s return is much welcomed given his physicality on both sides of the ball. Dan Goggin switches to twelve and needs to impress this week to realistically be a genuine starter for the rest of the season. Conway, Earls and Wootton form the back three and it will be interesting (weather permitting) how Munster Rugby’s back line play will fare tomorrow in Galway. With Carbery and Mathewson at the half-back berths, quick ruck ball is paramount to launch the back line. 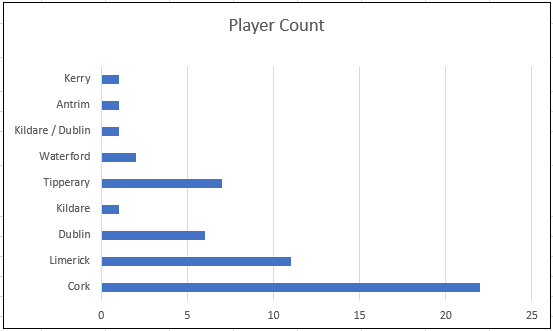 The ruck ball in recent weeks has been very slow, poor setup on the ruck too (additional player or two over committing to the ruck). Interesting to see how this facet of play goes from the team in red. A strong pack is named. Peter O’Mahony, Arno Botha and Tommy O’Donnell form an abrasive back row unit with Tadhg Beirne and Jean Kleyn in the second row. John Ryan, Jeremy Loughman and Niall Scannell in the front row. The cohesion issues in the line out should improve from tomorrow’s outing. The scrum set piece has been good, a good opportunity to run the rule over Loughman in a starting role. Andy Friend has wielded the changes for this encounter; an excellent home win against Ulster Rugby last weekend has seen the side infused with fresh legs. Inspirational captain Jarrad Butler misses out for the hosts due to injury but the back row is loaded mobility, pace and breakdown nous with Colby Fainga’a, Eoghan Masterson and Gorey native Paul Boyle in the ranks. The half back partnership of Blade and Carty continues; the partnership has excelled in recent weeks and why break continuity? The big news is that Tom Daly makes his Connacht Rugby debut alongside Tom Farrell. A potential abrasive, exciting three quarter partnership and will be tested by Goggin and Farrell on the other side of the ball. Matt Healy returns to the back three with Cian Kelleher continuing on the other wing. The lineup is complete by Darragh Leader who has looked a different player this season with his confident aerial and ball carrying ability. A strong Munster Rugby outfit; if the starting lineup fails to fire with ball in hand tomorrow, then massive questions in confidence will be raised in the camp ahead of a crunch European Cup pool finale. The bench looks strong with the likes of Murray, Bleyendaal and Stander in the ranks. The team need to deliver. Connacht Rugby have greatly impressed me this season. The absence of Aki is a blow and cohesive issues with Daly / Farrell will happen. The bench impact looks strong in the pack but the back line options look stretched and because of that, it is Munster Rugby who will edge this contest. The performance of Chris Farrell will be duly observed. Connacht Rugby: What Second Level Schools are developing the homegrown talent for the provincial setup? Munster Rugby: What Second Level Schools and local grassroots rugby clubs are developing the homegrown talent for the provincial setup? Leinster Rugby: What Second Level Schools and local grassroots rugby clubs are developing the homegrown talent for the provincial setup? Ulster Rugby: What Second Level Schools and local grassroots rugby clubs are developing the homegrown talent for the provincial setup? This blog series will look and recognize the secondary schools and local rugby clubs who are to the fore in underage rugby player development. They are at times the forgotten piece of the jigsaw. Without these schools and rugby clubs, there would be no talent pool outlet for the Irish provinces and national team to prosper. This article focuses on Munster Rugby. 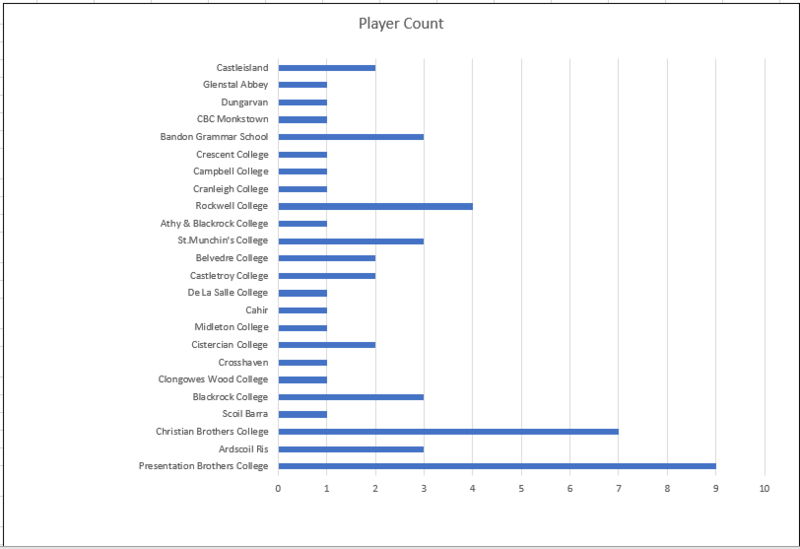 The statistics are based on the indigenous born players who have come through the Irish or Northern Ireland educational system. The statistics may surprise some but it is an exercise which provides key trends going forward. The Irish born player age profile in the squad is around twenty-six years. The current first team squad’s eldest player is Duncan Williams (32). The playing squad has a good blend of youth and experience. The emergence of academy talent such as Bill Johnston, Gavin Coombes this season bodes well for the club long term. The school county breakdown for the Munster Rugby squad is: Cork (22), Limerick (11), Tipperary (7), Dublin (6), Waterford (2), Kerry (1), Antrim (1) and Kildare (1). The conveyor belt of talent from the Cork school system is self evident in this squad makeup: PBC (9), CBC (7) are well represented along with several other Cork county schools. Rockwell College continue to produce high quality talent. They currently provide four Munster Rugby squad players at present including JJ Hanrahan. The local rugby club scene is well represented in the Munster Rugby squad ranks with the Cork and Limerick rugby club juggernauts all well represented. Munster Rugby are three points clear in Pool 2 after a three try second half performance over a hard working but limited Castres outfit at Thomond Park. Hawkeye Sidekick was at the Limerick venue and provides his thoughts on proceedings. The day started with excitement and optimism for Munster Rugby supporters heading to Thomond Park for this European Cup fixture; a fixture to see the debut of Conor Murray and Joey Carbery half-back partnership as well as Chris Farrell who was in superb form last weekend. As the fans started to arrive to the hallowed rugby venue, it soon emerged that Carbery would play no part in the contest (hamstring) and after a lengthy consultation with medical staff during team warm ups, Chris Farrell was also forced to sit this fixture out. Two key personnel withdrawals for the Irish province but in JJ Hanrahan and Sam Arnold, the side still look loaded with talent and creativity to execute an efficient attacking game plan. Tyler Bleyendaal and Jaco Taute were called into the match day squad and the training drills pregame were executed in a heavy torrential downpour, the visibility reducing with each passing minute. The windy conditions were extremely tricky for both sides. The opening exchanges typified with the visitors unable to deal with Murray’s first three box kicks given the cross field breeze at play. 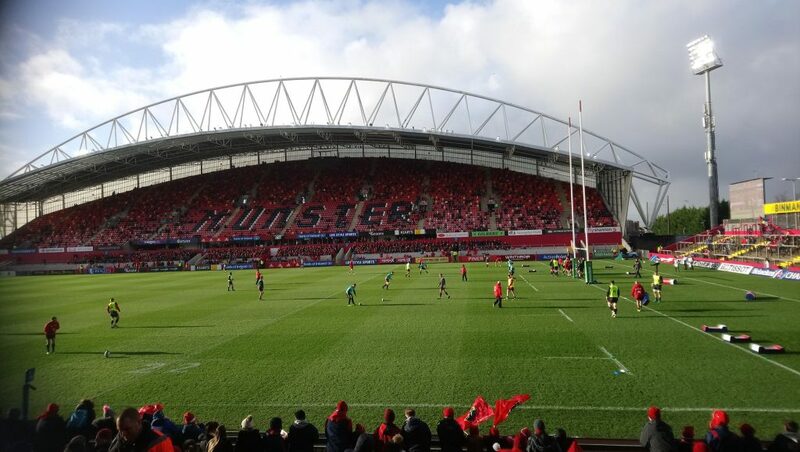 Munster Rugby as well were struggling with the conditions as well as Mike Haley kicked out in the full early doors. The game looked for all intensive purposes to be a pack arm wrestle early doors. The pack battle was fascinating in that opening period. Munster Rugby with John Ryan and Dave Kilcoyne prominent in the scrum set piece were winning penalties and setting the attacking foundation for the side. JJ Hanrahan was presented with a regulation three pointer to open the scoring in the first ten minutes of the contest. Munster Rugby were looking to create a high tempo game but Castres were resolute in defensive duties and their breakdown work at times stifled the hosts ability to create quick ruck ball. The line out exchanges ebbed and flowed in the windy conditions. Munster Rugby resorting to the long throw at the back of the line out more than once which did not have the desired effect. The line out was shaky at best for the hosts and with it squandered several opening period opportunities. The second quarter was all Munster Rugby; predominantly camped in the Castres 22 but there was a lack of composure in the attacking lines from the hosts; forcing passes which were not on due to the weather conditions and the back line running lines were at times ponderous and static with minimal supporting runners. The passage of play whereby Conor Murray realizing that Castres had over committed players to the left hand side switched play but there was a total breakdown in communications with Tadhg Beirne who knocked on. It summed up the host’s lack of precision with ball in hand. Castres were happy to hit the dressing rooms at half-time only 6-0 down. JJ Hanrahan slotting over another close range penalty after good play from the Munster pack in the second quarter. All Munster Rugby dominance but the pressure built up not yielding the desired points on the board. With management instructions ringing in their ears, Munster Rugby started the second half with renewed tempo and vigor putting pressure on Castres to force a series of scrums just on the Castres 22. Murray to the fore as his line break saw a deft offload to Rory Scannell to crash over. JJ Hanrahan slotting over the extras and the game was out to a thirteen point lead. Immediately after the concession of the opening try, Castres rumbled into life and were rewarded a penalty which was missed but Murray knocked on in the dead goal area. Castres with a five meter scrum but the resultant ball carries were utterly dismissed by the hosts. Beirne prominent as Castres lost possession on the Munster Rugby 22′. The box kick clearance from Conor Murray marked the end of the contest as Castres again needed to put in the tackle count as Munster Rugby started to probe further. More quality work from Conor Murray setup the second Munster Rugby try of the afternoon; created space inside for CJ Stander to cross over the try line. The score settled Munster Rugby nerves to a certain extent and more good pack pressure resulting in JJ Hanrahan slotting three points to make the score 23-0. The game was over as a contest. The key question was whether Munster Rugby could score an additional two tries in the last fifteen minutes? The third try arrived with around five minutes left in the contest and it was probably the best move Munster Rugby conjured up in the whole contest. Superb line break and offload from Arnold to Scannell, Scannell to Mathewson who then setup Hanrahan away for the third try. 30-0 as JJ Hanrahan kicked the regulation conversion. If the Munster Rugby faithful were thinking of a late bonus point try, it was quickly snuffed out as JP Doyle was central to a baffling officiating decision. Andrew Conway was adjudged to have taken a Castres player out before receiving the ball just five meters from the Munster Rugby try line. A dead cert penalty try but Doyle botched the call and gave Castres a penalty instead. A penalty try would have seen Munster Rugby restarting and more than likely securing field position for a possible bonus point try. Oh well! Castres’ pack mauled the ball to within ten meters of the line and then decided to launch the ball wide and resulting in a try out in the corner despite the best efforts of JJ Hanrahan. 30-5. Full Time. The bonus point not secured and whether this proves to be a missed opportunity, we won’t know until January 19th. The officiating at times descended into anarchy. Doyle lost control of this fixture in the opening period; no repercussions for Castres at the scrum as Munster Rugby dominated and won a series of scrum penalties. The players decided then to settle old scores and a couple of flash points ensued. The Conway decision summed up a bad day in the office for the officiating crew; it was an easy call. If Conway was getting yellow, then surely it implied preventing a certain try. Penalty try. Castres fans were scratching their heads like the home faithful. Munster Rugby adapted to the late personnel scratches but there was a nervousness in their attacking play. There was precious line breaks in the opening period and the line out malfunctioned at a rate of knots. Cleote acting as first receiver had mixed result; ball was potentially a little delayed and did not provide colleagues with the time and space to impress. Cleote and Beirne in breakdown work were on point. A reality check for Munster Rugby in their attacking play. Defense was solid if not overly stretched to breaking point such was the limited ball that Castres had in the Munster Rugby 22′. The mission is clear for Munster Rugby; a road trip series against Castres and Gloucester Rugby will determine their European Cup ambitions. Roll on next weekend!